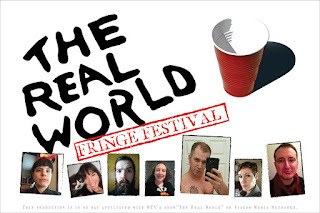 Cherry and Spoon: Fringe Festival 2016: "The Real World Fringe Festival"
Fringe Festival 2016: "The Real World Fringe Festival"
Summary: Like an episode of MTV's Real World franchise, except it's onstage instead of on TV, and it's at the Fringe Festival. Highlights: Confession: I was a loyal viewer of The Real World back in the early days, before there even was such a thing as social media. But in this Real World, the housemates spend most of their time on their phones, worrying about their social media presence. This allows the creators to skewer not just reality TV, but also our larger obsession with social media. We meet the seven housemates (a disappointingly less diverse cast than the real Real World casts) in a series of vignettes, complete with "testimonials" Real World style. The cast (David Beukema, Sarah Broude, Stephen Frethem, Rachel (Finch) Postle, Marcia Svaleson, Rob Ward, and Katie Willer) is great and fully commits to their larger-than-life stereotypical characters. There are some amusing observations about the social media world and some clever fourth-wall-breaking and acknowledgement of being on a stage. I wasn't wowed by the show, but it was kinda fun.